← June book club: join us on Sun., 6/11, at 1:30 p.m.
Update (6/10): Registration is now closed for the two complimentary classes. However, we invite you to join us for any of our 15 weekly classes: see the full schedule here, and the class descriptions here. In keeping with our mission to provide affordable yoga to our community, our class fee is $5 per student. We are looking forward to returning to South Warren Middle School for its 3rd Annual Health & Safety Fair on Thurs., May 18. 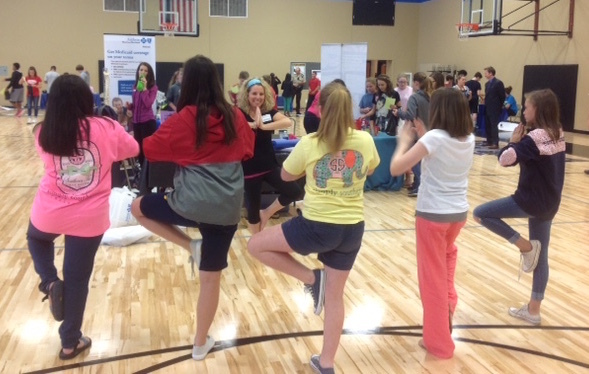 We hope the 7th graders are ready try some yoga with us again this year! If your student brings home a business card offering a complimentary class at 4yoga and you would like to sign up for one of these special SWMS classes, follow this link to register: tinyurl.com/SWMSyogaclass. Sat., June 10, 2-3 p.m. Sun., June 11, 7-8 p.m.
You are welcome to register either for yourself or for yourself and your student; however, if your student would like to participate, a parent will need to take the class, as well. Please note that space is limited and the registration deadline is 7 a.m. on Sat., June 10; we will disable the link and update this announcement when the complimentary classes are full. If you are unable to attend one of the complimentary classes, we welcome you to any of our other affordable and accessible community yoga classes: the class fee is $5, we provide mats and props, and you can see our full schedule on the calendar page. If you have questions about the types of classes we offer, please check out the class description page and then email us (4yoga.me@gmail.com) if you have any questions about the best class for you. We look forward to seeing many of you soon at the 4yoga studio in downtown Bowling Green–above The Pots Place (428 East Main Street), overlooking Fountain Square! This entry was posted in community, health fair and tagged complimentary class, South Warren Middle School. Bookmark the permalink.